LineBallTennis - Clapham Common: The Wait Is Over - But Not For Brexit! The Wait Is Over - But Not For Brexit! 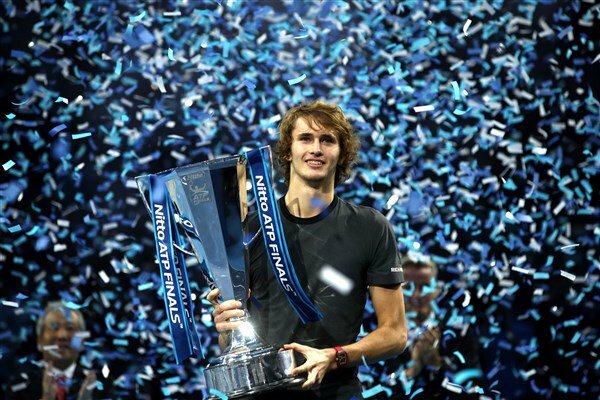 Alexander "Sascha" Zverev has broken into the elite crop of tennis players, from the emerging Next Generation of stars. Like the rest of the tennis world, LineBall Tennis have been waiting anticipating the "nextgen" star to make his break-through, in the men's game. We categorically believe the wait is over. 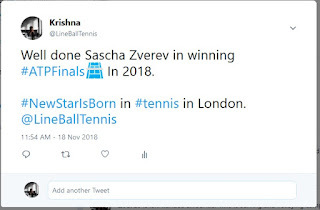 Alexander "Sascha" Zverev Winning the ATP Tour Finals on 18-Nov-18: "A Star isBorn"
"Sascha" is often shortend for Alexander in Russian, is still only age 21 and has made his emphatic emergence: by convincingly winning the end-of-year shoot-out of the year's top eight players at Nitto ATP Finals, in the O2 Arena in London. The emergence is clear from a number of standpoints, other than simply that he defeated the world number 3 and number 1 back-to-back in the semi-final and then the final, Roger Federer and Novak Djokovic respectively, in London. 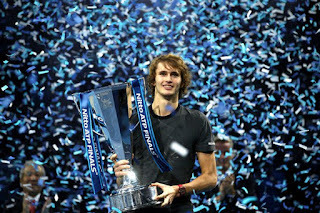 Sascha on Sunday topped-off a progressive year winning the biggest career title to date, and the yougest to win the year-end finale. After that win, there is also the matter that he has finished the year ranking number four in the world for the second consecutive year. Another factor is Sascha's his top-echelon status was rubber-stamped by his idea to hire Ivan Lendl as his coach in August of this year. Another great hall mark of his bust-though emergence is the batch of nextgen players he left in his wake: Thiem, Tsitsipas, Fognini, Khachanov, Medvedev, Dimitrov, Dolgopolov, etc. LineBall Tennis's principal tennis coach Krishna draws a comparison with a precocious 17-year old who also announced his arrival on the big-stage of tennis, by winning the most prestigious of tennis grand slam titles, Wimbledon. Of course Boris Becker, who is German, same as Sascha's birthplace and Hamburg-upbringing, though of Russian descendency; and a 6-time tennis grand slam champion made that first giant-leap. Some tennis pundits and experts have often debated about the attainment of maturity of players from various parts of the globe. Germans arguably mature faster given the other factors to producing a top national player. 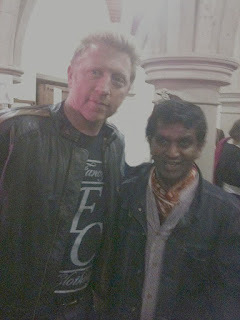 Krishna, like his personal idol Boris Becker (see picture below), is excited about Sascha as the future cynosure of tennis. Andrew Castle, former British number one tennis player, and these days a TV and LBC-radio broascaster including tennis commentry at Wimbledon and ATP Finals, also had some comparative insight. Andrew remarked to Krishna, while passing by the Clapham Common public tennis facility where LineBall Tennis operates, that similar to Boris, Sascha is "more arrogant". We all know Boris was "arrogant" or at least in his outward strut and ostentation; interpreted for tennis as confidant, self-assured and with strong mental fortitude. Andrew, having much speculated about "NextGen" players coming of age and a natural and much-anticipated changing of the guard, also remarked "we need the change" in men's top tennis. 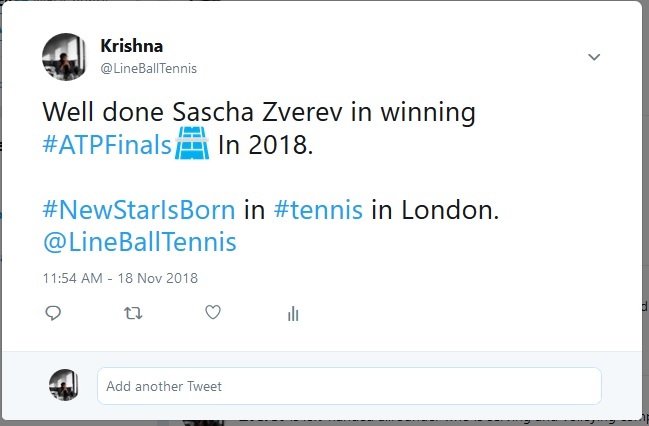 Another remarkable aspect of the ATP Finals final versus Roger Federer was an incident where a point-in-play was interrupted at the request of Zverev, towards the crucial end of the second set, Zverev having one the first (oddly only one one match went to three sets the entire week-long finals). The incident resulted in booing and jeers by sections of the crowd at the O2 final. At courtside during winner's prize-giving conversation with commentator Annabel Croft, a former British women's number one player, crowd started prolonged booing. Zvevrev showed his humility by recognising and apologising for halting the play. He explained to the crowd that a ball-boy at the back had dropped the ball, and it had rolled on to the court with the ball-boy rushing onto court to retrieve it; which presumably distracted Zverev attention away from the ball, and subsequently he halted the point. Which is irrefutably in the ATP rules, as Annabel clearly politely asserted to the non-tennis fans in the crowd. Indeed TV-video evidence does show that to be the case. Even during the enquiry to the circuit-umpire Carlos Ramos for the reason to halt-play, Federer asked the offending ball-boy. The ball-boy is seen nodding. Zverev as the winner was also seen apologising at the net to the vanquished Federer as they shook hands at the end of their match. Holidays in Maldives was commented as the place of destination in the off-season that Sascha Zverev and friends embark to. He had done so in 2017 as well. LineBall Tennis wish him an enjoyable rest and recuperation, and thank the tennis Gods that the long-wait for a new star is finally over. Yet the wait for United Kingdom to leave the globalist-agenda of the European Union, known as'Brexit', is still prolonging its delivery since June 2016 vote by the British people to leave union of European countries. One doese not expect democracy to be more tenuous than finding a tennis star, as LineBall's activists Twitter comments attest (Picture below).